Don't worry shredders, we at N Stuff Music have got you covered! Fantastic guitarists such as Tosin Abasi from Animals as Leaders, have proven the artistic direction that is possible with 7 and 8 string guitars. These guitars allow for much more bottom end with lower strings and create that high-gain sound shredders everywhere crave. 7 and 8 string guitars do come with a slight learning curve when learning to play them. The lower strings whether it be one or two, create a very different feel for playing the instrument itself. Even so much as simple chords and scales that you learn in the beginning months or years when starting the guitar can more difficult to play due to the difference the extra string(s) can make when first picking up the instrument. However, with some good practice and learning they can quickly turn into the tools in which enhance many abilities to create new and exciting music. The ESP MH-417 is a 7-string, low-end monster made with Mahogany wood and active EMG pickups. 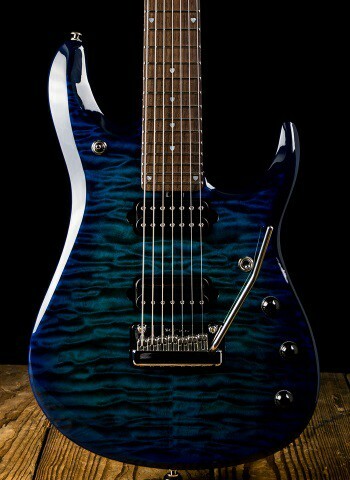 The inclusion of EMG pickups with this 7-string guitar embody the deep, low-end character that this guitar was made capable of producing. The Schecter Hellraiser series produce some of the finest 7 and 8 string guitars that shredders can purchase on the market today. 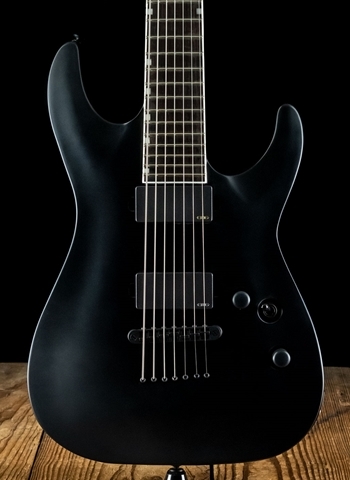 The C-7 is a 7-string option that provides EMG active pickups in combination with a low "B" string that caters to those guitarists who need those extra strings to play some of the Animals as Leaders, Avenged Sevenfold, and original music they seek to write to pave their musical direction. 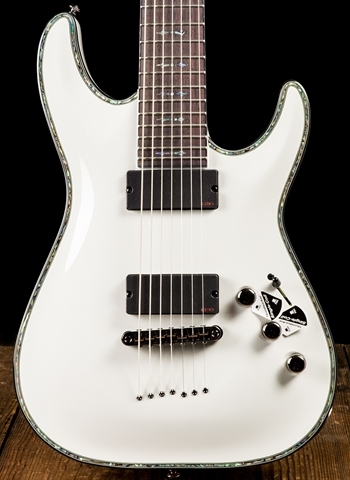 At N Stuff Music we carry a selection of 7 and 8 string guitars in order to appeal to those shredders who love the extra strings to recreate some of the favorite heavy metal riffs as well as innovate heavy music that will continually inspire them to practice, play, and perform. Chat with us online today on our site; we are happy to discuss what products may be right for you and are eager to answer any questions that may help tailor your decision to finding the right instrument for you.